The cities of Sweden have much to offer the discerning traveller: fascinating architecture, historical squares, museums, world-class art galleries, wonderful parkland and botanical gardens, extensive archipelagos and excellent shopping opportunities. This seven-night rail itinerary takes in the three largest cities in Sweden and offers the freedom to explore at leisure. On arrival at Copenhagen Kastrup airport take the train across the Oresund Bridge to Sweden’s third largest city, Malmo. On arrival at Malmo central station self-transfer to the Master Johan Hotel in Malmo (650m from the train station or c.10-minutes taxi ride). Overnight at the MJ Hotel, Malmo. Opportunity to explore the compact centre of Malmo including the pretty Lilla Torg square, Slottsparken and the Western harbour. Malmo is a shoppers dream destination with pedestrianised streets and indoor shopping malls, perfect for picking up items by Scandinavian designers as well as local souvenirs. Unlike many Scandinavian cities, a large number of shops in Malmo are open on a Sunday. After breakfast, self-transfer to Malmo central station for a rail transfer to Gothenburg (c.3 hours). On arrival in Gothenburg, self-transfer to the Clarion Hotel Post, a short stroll from the central station. Overnight at the Clarion Hotel Post, Gothenburg and The West Coast. Opportunity to explore Sweden’s second largest city. Do not miss the Haga district, Liseberg amusement park, the Slottsskogen city park and the rose garden. To see a different side of Gothenburg we would recommend visiting the city’s southern archipelago (accessible by tram and boat). After breakfast, self-transfer to Gothenburg train station for a rail transfer to Stockholm (c. 3 hours). On arrival at Stockholm central station, self-transfer to the Hotel Skeppsholmen (2 km from the train station or c.10-minutes taxi ride). Overnight at the Skeppsholmen Hotel, Stockholm and surrounding countryside. 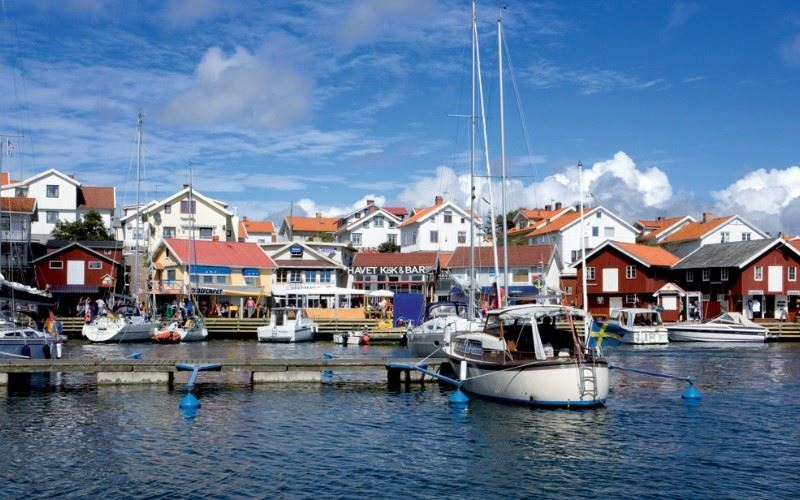 Opportunity to explore the capital of Sweden, one of the most picturesque cities in Europe. Take a boat trip along the city’s canals, enjoy a cruise into the archipelago, explore the historic district of Gamla Stan, shop to your hearts content or visit one of the many excellent museums – Vasa Museum; ABBA Museum; Skansen and Fotografiska to name a few. After breakfast, transfer to Stockholm Arlanda airport for your return flight to the UK. With its preserved medieval character and vibrant atmosphere, Malmö, Sweden’s third largest city, is a delight to explore on foot or by bicycle and is an ideal destination for a city break. The MJ Hotel is located in the heart of Malmo; just a stone’s throw from Lilla Torg, one of the city’s most captivating squares and filled with restaurants, cafes and enthralling 16th century buildings. Built in 1990 and recently remodelled, the hotel offers spacious accommodation of the highest standard and a relaxed sophisticated environment. Its concept is to offer guests 'an urban oasis made by friends' and its interior design is plush and artistic. This is more than a hotel, the MJ is also a popular spot for residents and its after work drinks and cocktail bar (serving light meals) are quickly becoming a local institution. Business rooms have a separate living room with double sofa bed (suitable for 1 adult or 2 children). One business room has two bedrooms. The Clarion Hotel Post is located on the canalside in the centre of Gothenburg, a stone’s throw from the central train station, the Nordstan shopping centre and the 19th century park of Tradgårdsforeningen with its manicured lawns, rose garden and palm house. A stay at the Skeppsholmen Hotel is unlike any other hotel in Stockholm. No where else can you be so close to the centre of the city yet feel so far away. In fact the island, from which the property derives its name, is a tranquil green oasis that stands in complete contrast to the islands of Gamla Stan, Sodermalm and Djurgarden which surround it. It is this location which sets the hotel apart. Housed within a listed 17th century military barracks, the Skeppsholmen Hotel has been tastefully decorated throughout by the award winning designer, Claesson Koivisto Rune. Cool greys and neutral colours add a Scandinavian feel to the guest rooms whilst in the public areas, light creams, natural wood and large windows allow the outside environment to flood in. Sit on the terrace on a fine day and enjoy the sea views. A relaxing and personable property only 15 minutes walk from Gamla Stan, the Royal Palace and the departure piers for boats to the archipelago. Rooms in the annexe building will be quieter. A popular hotel for weddings and conferences.